Ditch the overwhelm and grow your business faster with this deceptively simple change. 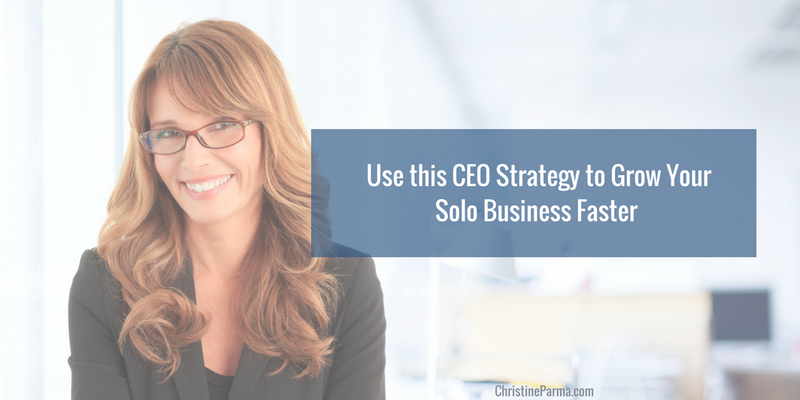 As a solopreneur or freelancer, you aren’t just a business owner… you are the CEO of your company! But a lot of hard-working entrepreneurs aren’t approaching their business like a “real” CEO would and it leads to a lot of unnecessary overwhelm, frustration and too little pay-off for all of the hard work. I’m going to help you ditch overwhelm and help you grow your business faster with a deceptively simple shift. It can make a huge difference in how much you get done each day and how much you make this year. I’ll also show you how to decide where you need to be focusing your efforts to make the biggest difference in your business in the least amount of time. Plus, you’ll take the first step toward taking control of your business to-do list so you can stop spinning your wheels and move toward that 6-figure mark fast… and do it with a lot more joy, grace and ease! You can also watch this video in which I dive into this strategy in more detail. Take a look at any successful company and you’ll find a visionary at the helm. The CEO’s job is to look out into the future and imagine what the company should look like and then lead her team in turning that vision into reality. CEOs direct the company from a high-level, chart the course for the team to follow and keep the focus on investing the company’s time, talent, energy and money on the activities that yield the greatest return on investment (ROI)… and even if you’re a solopreneur, you should be doing the same. Even if your business isn’t banking millions yet, you can still shift how you approach managing and growing your small business to be more like that of a “true” CEO. To help you get started, I’ve put together a free checklist that will guide you through how to free yourself from a lot of the tasks that keep you busy but don’t bring cash in the door. If you can relate to any of these, it’s probably because you’re spending too much time on the wrong things (namely things that aren’t truly important to your business’ growth), you’re running around taking care of things that seem urgent and important but really aren’t and/or you simply don’t have a real plan for managing and growing your business… all of which can spell big trouble for your profitability and your sanity! I’ll give you some examples. If you work from home, you might get distracted by doing laundry, going grocery shopping, cleaning the house or any number of personal to-do’s you’ve got to handle (often because you’re procrastinating about doing a truly important but uncomfortable business task). Or you might get on social media (because you’ve read you need to), but you might not be approaching it strategically, so hours pass by and you don’t have much to show for all that time spent clicking around. Or, wow, are you ever busy! But you still wonder why despite being so busy, you have so few paying clients. Or, you simple throw something out onto your blog or social media page because you figure doing something is better than nothing, even though there’s no strategy for how to make money from those posts. In order to stay in business, you have to shift how you approach spending your time and energy and take a hard look at what the return on investment (ROI) is for everything you do. And I do mean everything. If the answer is yes, then it’s likely a truly important activity that you should be doing more of. In The 7 Habits of Highly Successful People, Stephen Covey calls these “Important but Not Urgent” activities, which include things like establishing the vision for your business, working with a mastermind and acquiring skills that will help you grow your business. If the answer is no, then it’s probably an activity you can eliminate entirely. If you’re not comfortable doing that, sideline it for a bit and see if you can get along well enough without doing it. If you can, then kick it to the curb if it’s not a necessary business activity or delegate someone else to do it if it is necessary but not necessary for you to do it. Does the particular activity have a high ROI on time, energy and/or money invested? For example, marketing your paid programs and courses in a way that brings new clients in, generates revenue and has a high ROI (when done correctly). Doing your business bookkeeping does not have a high ROI. Sometimes an activity can have a high ROI possibility, but it may not be generating a big return for you. This usually comes down to a lack of skills or expertise associated with that activity that can often be solved by additional, specific training or outsourcing that activity to a specialist. A perfect example is Facebook ads. Some people are crushing it and generating hundreds of thousands of dollars (or more) using Facebook ads to promote their programs, products and services. Others are trying to use Facebook ads in their businesses and losing their shirts because they either their ad images aren’t working, their messaging (offer) is off, they’ve got their target audiences wrong or they don’t have a specific strategy for monetizing the traffic generated by the ads and recouping their investment. Want to know which activities you should be focusing on to quickly grow your business to the 6-figure income mark? Download the checklist now. If the answer to the question above is “no” or “not yet”, what do you need to change in order for that activity to actually pay off and be worthwhile? Or, should you stop investing your personal time and energy in it altogether and outsource it to someone else? For example: When done strategically, using social media can help grow your business and revenue quickly. But, is the time you’re spending on social media really paying off for you? If not, why not and what needs to change to make it profitable? When you run your daily business activities through the filter of these questions, you’ll quickly see which ones aren’t worth doing anymore or aren’t pulling their weight by contributing to the growth of your business. Then, it’s a much easier task to ax the ones that aren’t currently worthwhile and instead focus your energy on the activities that are. 1. How would you approach deciding what you’re going to offer, both in terms of paid programs, services and products and free resources? 2. How would you start and end your day? 3. What kind of work schedule would you follow? 4. What would you delegate to others or stop doing entirely? In the meantime, grab your big business to-do list and start running each entry through the list of questions outlined in this post. Do they pass the high ROI test? Is each pulling its weight in your business? You only have a finite amount of time, energy and (probably) money, so invest it wisely! I’d love to know… If you approached your business like a “real” CEO, how would you think and act differently than you do now? Please post your answers in the comments below! Like this post? Please click the heart below and share it with your friends! Christine Parma helps mamas on a mission build profitable, soul-fulfilling businesses without working 24/7, missing out on precious moments with their families or sacrificing what matters most to them. Step by step she shows them how to create the time and systems they need so they can follow their dreams, get paid what they’re worth and be amazing moms, too…. because you shouldn’t have to choose between the ones you love and running a profitable business. Learn more about how she can help you get your life back in balance, get paid what you’re worth and create success on your terms at ChristineParma.com.